When I first arrive on the fifth floor of the Bridgeport Art Center, I think I am lost. All I see are mannequins and draped fabrics, studios in the Fashion Design Center––decidedly not clay. It’s not until I exit through the other side of the elevator and turn two corners that the exposed brick walls and raw concrete edges give way to an entrance at the far end of the hallway: a white wall with “Chicago Ceramic Center” written in thin grey sans-serif. The Chicago Ceramic Center began construction only seven months ago, but Jay Strommen, director of the Center, says its origins go back to 2007. Placed on the back burner after the economic downturn, the center finally started to look more like a reality a year ago, when additional funding was allocated for the project. It’s a large space, with smaller rooms delineated by “floating” white walls, seemingly unconnected from floor or ceiling. “Political Clay” brings together the work of ten artists and thirteen pieces total. Touching upon topics including race, religion, and technology, the works vary in their directness of political message. One piece is bluntly titled “The GOP,” and is made up of a herd of thirteen or fourteen small white elephants, no taller than two feet. The artist, Derek Walter, points me to the definitions pasted onto the backs of a few of the elephants, reading, “white elephant, n. 1. A possession unwanted by the owner but difficult to dispose of. 2. A possession entailing great expense out of proportion to its value for the owner.” It’s a frank simile come to life, one that is satirical and biting, but also fanciful in its manifestation. Some elephants are embellished with chains; others have coin slots at the top. Upon the back of one elephant armed with cannons and guns lies a small cherubic child. A red, white, and blue ribbon loops around the entire spectacle, from elephant to weapons to cherub. To top the sculpture off is a bald eagle, wings outstretched, perched on top of its trunk. 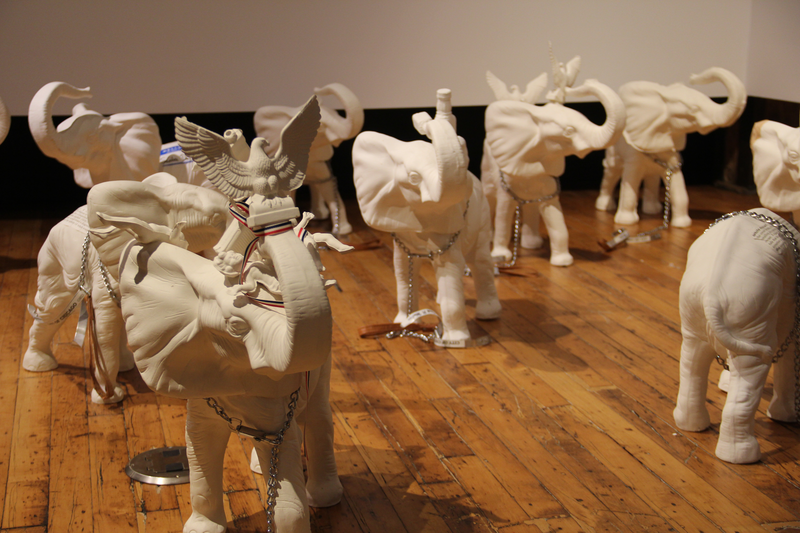 As Walter told a small audience, he originally arranged the elephants in a march, but later on placed them into disarray to reflect the current state of disorder within the Republican Party. “It’s kind of a protest,” he says. And then there are the more subtle works. Catherine Schwalbe’s piece, “Lake Michigan,” is made up of two major components. On the wall, five white porcelain shapes are covered in writing, some of it legible, some not. I read “ice cover” and “decade.” On a shelf below sit five canisters of water. It isn’t until I ask her about her work that I finally understand that each shape represents one of the Great Lakes; each canister holds ice collected from each lake during the Polar Vortex of 2014. In an exhibition titled “Political Clay,” it seems odd that the political message isn’t at the forefront of the artist’s goal. Yet looking around, none of the works come with the usual informational plaque; each has only a number at its side. As much as some pieces fall under the category of art activism, some seem to reflect more on energy and momentum than any critique of current affairs. I am getting ready to leave when the next wave of people arrives. From one corner of the room, I hear laughter and mentions of Trump, Carson, and poll numbers. I don’t recall seeing any works with a more conservative viewpoint and wonder if pointed political art must always take the form of critique and warning. My mind goes back to the splatters of ink, a painting in a room of clay. On the future of the Chicago Ceramic Center, Strommen tells me, “We’re going to bring curators from different parts of the community. The gallery is going to have an identity that’s not just traditional clay.” So far, the Center has quarterly exhibitions planned, one of which will be a food and ceramics show in collaboration with chefs. He mentions plans to transition the Center into a nonprofit, and the possibility of an outreach program; it already offers classes in “Beginning Wheel Throwing” in a classroom that borders the exhibition space. For now, the Center is mostly empty space, wood floors, and white walls, but as far as beginnings go, it’s not a bad way to start. Thanks so much for the information on this exhibition. I am excited about this art center and looking forward to seeing this show. Very timely.